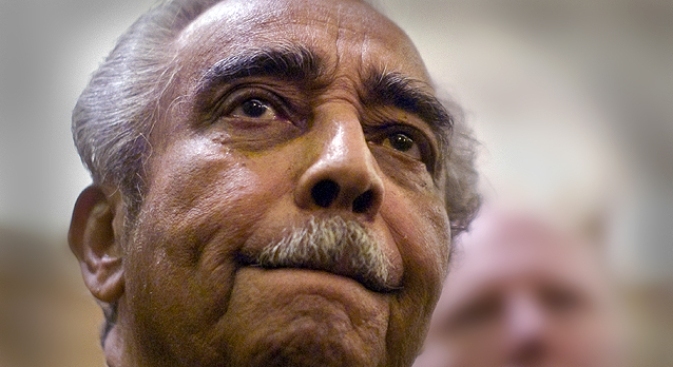 Charlie Rangel apologized for his off-the-cuff remark after Mayor Michael Bloomberg gave him a piece of his mind. U.S. Rep. Charles Rangel says he's sorry for flippantly suggesting that President Barack Obama bring an ID with him when visiting Harlem, where a black police officer was shot and killed by a white colleague last week. "It was entirely inappropriate to bring the President and his wife into this discussion during their visit to New York, and I hope my off-the-cuff comment did not cause embarrassment to anyone," Rangel said in a statement. Mayor Michael Bloomberg lashed out at Rangel on Sunday, calling his remark “plain wrong." "I have a lot of respect for Charlie Rangel, but in this case, he's just plain wrong,” Bloomberg said as he marched in the Salute to Israel parade on Fifth Avenue. Bloomberg said he spent Saturday night with the slain officer's widow and children. Officer Omar J. Edwards was shot to death Thursday on a Harlem street. He was in street clothes chasing a man and had his service weapon out when three plainclothes officers on routine patrol yelled for the two to stop, police said. One officer opened fire and hit Edwards three times, killing him, police said. It wasn't until medical workers arrived that it was determined he was a police officer. Investigators are trying to determine whether anyone was at fault, and the shooting has sparked concern about whether race played a role. While Rangel recanted his off-the-cuff comment, he praised Police Commissioner Raymond Kelly for saying that race may have factored into the shooting and called for improved cadet training in light of last week's tragedy. He also publicly called on Attorney General Eric Holder to investigate cases within the NYPD when white cops kill black ones, which he says is "too often the case." Rangel was apparently alluding to the shooting when a Daily News reporter asked him Saturday what he thought the president should do while visiting the city. “Make certain he doesn't run around in East Harlem without identification,” the congressman said. He also said that the chances of a police officer “of color” getting shot by a colleague were higher than for a white officer. The president, fulfilling a promise he made to his wife during last year's campaign, took the first lady to a West Village restaurant on Saturday, before the couple headed to Broadway to see a play.